What’s your favourite marketing strategy? If you’re a regular reader of this blog then you probably already know that mine is video. Whether you have a favourite or you don’t, it’s important to remember that with marketing you shouldn’t stick to just one strategy. In fact, the more you use, the better! But the real magic happens when you use two different strategies together. As you have probably already guessed from the title, I’m talking about video and email marketing. This article is intended to act as a definitive guide for anyone who wants to know how to use video in their email marketing strategy, from best use cases, all the way through to different options for using videos in emails. If you’re already a whizz-kid when it comes to email marketing, then feel free to skip this part and go straight to the ‘How To’ section below. If you’re not a whizz-kid, then stick around and take a look at some of the best use cases for videos in email. One of the best ways to increase your click-through rate (CTR) is to whet your recipients’ appetite with a great video that will leave them wanting to find out more about whatever it is you’re selling. You can bet House of Cards fans clicked on that play button faster than the speeding train that hit Zoe Barnes! In all seriousness, the level of immersion created by this Netflix email is what makes it stand out in inboxes and not only get clicked on, but shared too. This email was written about in tons of news outlets and created a real buzz for the upcoming season. An email marketing-video marketing WIN! Did you know that 75% of Gmails 900 MILLION users access their accounts via mobile devices? That means when you send an email to your customers, there is a large chance it will land right in their pockets. That’s a personal way to communicate with your audience, so why stop there? If you have an announcement to make, such as introducing a new product, service, or offer, then personalised videos within your emails can be a great way to gain some extra traction. There is no play button here because this video was embedded directly into the email (more on that later!). A quick video is a helpful addition to any announcement email because, according to Hubspot, 55% of people consume video content thoroughly. So if you want to explain something to your potential customers, video is one of the most effective ways. This is arguably the easiest way to include videos in your email marketing campaigns, and we’re all pretty familiar with thumbnail images that have play buttons over the top of them. It’s the universal sign for: This is a video! Users who click the play button will be taken to a third-party site (like YouTube or Wistia) to watch the content, so the fuss for you is minimal. All you have to do is include the image that you want to act as a thumbnail and add a hyperlink that will take viewers to the video. Easy! Animated GIFs are a great way to capture your recipients’ attention because they will start playing as soon as an email is opened. With GIFs, you can add movement without too much programming or coding, but sound cannot be supported. To create a GIF, head to Giphy. It is a public website that allows you to create free GIFs from your videos. Once you have your GIF, just add it to your email in the same way that you would an other image. Although GIFs are widely supported by many email clients, they won’t look good in all of them. When it comes to Outlook, anything from 2007 onwards will only show the first frame of your GIF due to compatibility issues, so make sure it includes as much important information as possible! This looks pretty negative, but the clients that do support video represent over half of the market share. So there is just over a 50/50 chance that your recipients will be able to watch your video. If that isn’t a worthwhile risk for you then stick with one of the two options above. 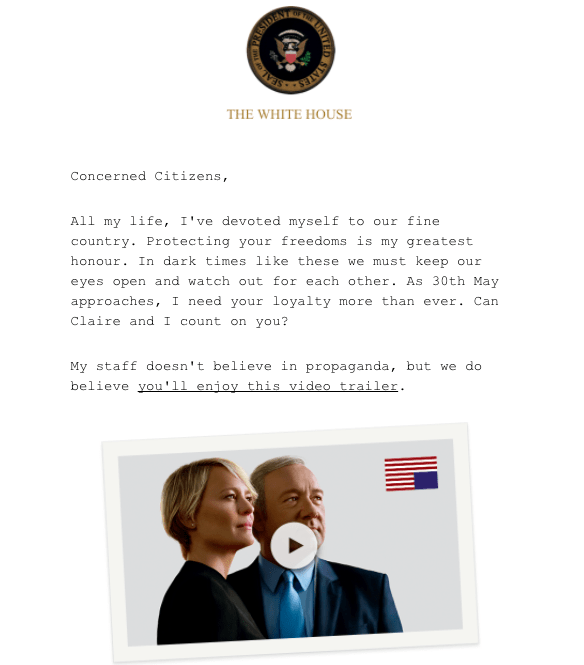 If you think it is worth the risk then take a look at this AMAZING “How to” guide for embedding videos in emails by Email on Acid. When using videos in your emails, there are a couple of things that can help you to make a larger impact. Top Tip #1: Use the text ‘Video’ in your subject line. A study by Syndacast found that using the text “video” in an email subject line boosted open rates by 19%. Include a call to action in your email encouraging people to share your video. We found that 76% of people would share a branded video with their friends if it was entertaining. Video marketing, with its proven track record of engagement, teamed with email marketing and its indispensable presence in consumers’ lives, are both incredible marketing strategies in their own right. But by using both strategies together, you will be able to connect to potential customers on an even deeper level, resulting in an increase in awareness, conversions, and, perhaps most importantly, brand loyalty.